We apply our resources, facilities, expertise and technical knowledge to help solve problems. The studios and edit facilities have been built to service industry needs with high-end, high-spec equipment and sound performance standards. 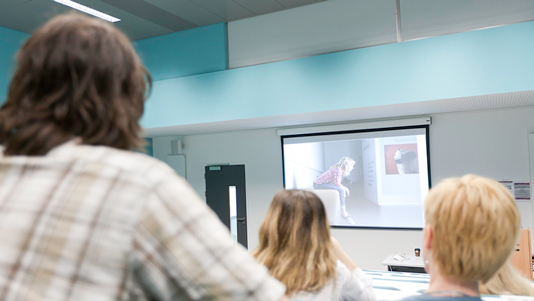 Alongside LSBU’s film location service can provide a one-stop shop at the centre of London for creative producers across, film, TV, photography, sound design and digital design. Visit the School’s Facilities page for more on the centre. Knowledge Transfer Partnerships (KTPs) are designed to help businesses improve their competitiveness and productivity by tapping into the knowledge, technology and skills offered by universities. LSBU has an enviable track record for KTPs, established over 30 years. The School of Arts and Creative Industries worked to create effective web-hosted video content through a KTP with Key20 Media, a London-based media and communications company. Working with arts and media academics, the School created a corporate film capability that became the business' biggest income generator. The KTP allowed Key20 Media to significantly reduce costs by relying less on third party suppliers, increasing investment in the business, ensuring better quality control and giving them the opportunity to become even more competitive. LSBU is one of the UK's leading KTP providers and won the collaborative Innovation Excellence Award at the London Knowledge Transfer Awards. We are also among a handful of universities that have been commended by the Higher Education Funding Council for England (HEFCE) for our KTP work. Find out more about working with LSBU through a KTP. This is an examination of how digital technologies can be integrated into teaching and learning processes to complement established practices. The project has introduced a prototype system using video recording equipment, developed using 3D modelling software and advanced digital prototyping techniques. Large-scale events needed specialist technical knowledge to develop a small scale Alternate Reality Game (ARG). ARGs are a highly innovative concept being used to promote big budget TV programmes, games and films but are not yet widely available on the commercial market.